The early reviews of A Star Is Born are in and they’re glowing. Any movie starring Bradley Cooper and Lady Gaga has a decent shot of doing well at the box office. But it’s not like we haven’t seen this movie before – this is the fourth time Hollywood made this film. The original 1937 version starred Janet Gaynor. A few decades later, Judy Garland landed the lead in the 1954 version, followed by Barbara Streisand in 1976. Why do we keep watching this movie? Maybe it’s because the plot taps into a shared, primal fantasy. We want to be stars. We want to be famous. We want to be celebrated. Of course, most of us – hardly any of us, in fact – will ever be celebrities. Instead, we’re left to reconcile our celebrity obsession with the reality of an unremarkable life. But an unremarkable life may not be so bad. For thousands of years, people have found spiritual and emotional significance by avoiding fame. In some cases, they have aggressively rejected the celebrity others tried to force on them. Here’s what we can learn from their example. A Star Is Born ticks off all the elements of a great story. But behind the story, there’s psychology – a deep-seated desire for fame. More than half of those who becomes famous achieve celebrity status before the age of 30. Since the odds of making it big drop with each passing year, a high percentage of young people are willing to sacrifice traditional goals for fame. In a recent study, a third of millennials said they would rather be famous than become a doctor or lawyer. One in 10 would opt for fame instead of a college degree and one in twelve would abandon or disown their families. Those statistics probably aren’t unique to millennials. We were all young once and previous generations harbored secret fantasies of becoming the next Joan Baez or George Clooney. Truth be told, on a bad day I still want to be Bono and I’m well past the 30-year cutoff for celebrity. But when we dig a little deeper, we discover that our shared yearning for celebrity comes from our shared experiences of injury, humiliation and neglect. Maybe it was a parent with high expectations and a reluctance to offer praise. Or classmates who made us feel like we were never good enough. Or a friend who treated us cruelly. Whatever the source (and it’s usually more than one), we want fame because we think it will insulate us from harsh realities of our experience. But that’s not how it works. The kindness we expect to find in celebrity never materializes. Actual celebrities are often incredibly wounded and vulnerable people – and their woundedness only gets worse over time because they experience a constant barrage of criticism and nastiness. In the end, all celebrity really means is that people know who you are. Understanding, appreciation, love, kindness – all the things that motivate us to desire celebrity are illusions. From social media to politics, celebrity culture permeates every nook and cranny of our lives. It’s even found its way into the church. Worship gatherings have become stage shows, pastors have become celebrity wannabes and congregants have become groupies, constantly chasing the next big thing. In fairness, not all churches or pastors have embraced celebrity culture. But even those who recognize the dangers of celebrity culture talk about it and toy with the idea of incorporating certain elements of it into their worship events and ministries. Celebrity culture has apparently become the new normal in Christianity – a prerequisite for growth in organized religion. Yet, for thousands of years, spiritual leaders across religions have actively shunned the idea of celebrity and the desire for fame. In the gospels, Jesus routinely walked away from crowds of people – not toward them. And when people randomly discovered his claim as the messiah, he urged them to keep it to themselves. In the fourth century, the desert mothers and fathers – spiritual rock stars who devoted themselves to lives of prayer and asceticism – left the cities because people started viewing them as celebrities. When the crowds followed them to the desert, they migrated to caves or lived on top of poles to escape attention. Born a prince, Siddartha Gautama abandoned the trappings of royalty to live as a mendicant, begging in the streets. Moved by the suffering he saw, he began a spiritual quest that transformed him into the Buddha, or enlightened one. Saint Francis. Mother Teresa. Gandhi. There are plenty of examples of men and women who sacrificed the pursuit of celebrity as part of a spiritual calling. Ironically, some of them became famous, even during their own lifetimes. But it wasn’t because they pursued fame or even desired it. They became famous because they proved you don’t have to be a celebrity to live a meaningful life. When it comes down to it, we all want to be celebrated. Appreciation, love and kindness are basic needs that validate us as human beings. They are signs that our lives have value, that somehow the world is a better place because we’re in it. But the way we find our value is by celebrating others. When we recognize the inherent, God-given worth of everyone we meet, we experience an exchange of the love and appreciation we crave. Through the validation of others and the gifts they bring, we find our own validation as human beings and as children of God. As a work of fiction, A Star Is Born is a great movie. But it’s also a stark reminder that celebrity culture requires a few winners and a lot of losers. Without millions of everyday people cheering them on, celebrities wouldn’t exist. In God’s universe, there are only winners – and it’s your job to celebrate them all. A few years ago, I toured Cleveland’s Rock and Roll Hall of Fame during the opening reception of a work conference. I was wandering aimlessly through the exhibits and my second free beer was starting to kick in when I ran across something that stopped me dead in my tracks. It was an old banjo head. Filthy and worn, it had holes in the places below the strings and seemed somehow out of place next to the memorabilia of Kurt Cobain and Jimi Hendrix and other rock legends. And just like that, I realized I was looking at what might be the most famous banjo head in the world, the piece of skin that sat atop the long-neck banjo played by Pete Seeger. Seeger was born in New York to musical parents. After a brief stint in the military during WWII, Seeger formed a folk group and was quickly dragged into the McCarthy hearings, where Congress wasted no time in branding him a communist. Undeterred, he met Martin Luther King Jr. and taught the civil rights leader how to use music as a tool for organizing groups of people in a common cause. Ever hear of the song, “We Shall Overcome?” It was the anthem of the civil rights movement and Seeger is the guy who sang it to King for the first time. Seeger spent the next 50+ years writing and performing songs that made a difference. From “Where Have All the Flowers Gone?” to the Ecclesiastes-inspired “Turn, Turn, Turn” to Woody Guthrie’s “This Land Is Your Land,” Seeger wrote and popularized tunes that gave working class people a voice by taking a stand for peace, the environment and the common good. If you haven’t noticed, there aren’t many Pete Seegers left in popular music. Today’s pop stars write songs about butts and boyfriends who have dumped them. But Seeger understood that music has a purpose. In the right hands, it can be a tool for achieving a higher purpose. Was Pete Seeger perfect? He would have been the first to say he wasn’t. None of us are. But it seems to me that there are several lessons we can learn from Pete – lessons that are especially relevant to those of us who are committed to helping bring change to the world around us. Do what you can, whenever you can. I think Seeger saw himself as a social justice worker who happened to play music. 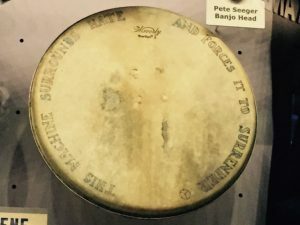 If he had different talents, the inscription on his banjo could just as easily have been etched on a typewriter or a piece of farm equipment that helped feed the hungry. The point is that you don’t have to be a musician or a writer to make the world a better place. Take the skills that you have and use them – constantly and tirelessly – to take a stand on behalf of the poor, the planet and the oppressed. A real deal is someone whose messages continue to resonate after they’re long gone. The things Seeger sang and wrote about are arguably more relevant today than they were fifty years ago because they were birthed from a place of authenticity. By all accounts, it wasn’t an act – Seeger lived the commitments he sang about in his music. He lived in a log cabin that he built with his own hands in 1949. He routinely performed for free and gave away the rights to most of his songs. When he died in 2014, he drove a 2002 Subaru and was said to have earned the annual salary of a construction worker. The takeaway is that it’s not enough to talk about doing the right things. Social justice begins at home with messages that are amplified through the way you live your life. If you ask me, the world doesn’t need any more celebrity athletes or politicians or pop stars. But we could use more Pete Seegers. A lot more. And who knows? Maybe the next Pete Seeger is the person staring back at you in the mirror.